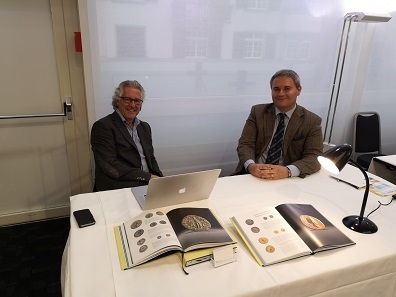 November 8, 2018 – The 47th International Coin Fair in Zurich took place at the Swissôtel in Zurich-Oerlikon on October 27 and 28, 2018. This year, the importance of cooperation was emphasized by dealers and collectors alike. This prevalent idea already became apparent a few days before the actual convention. 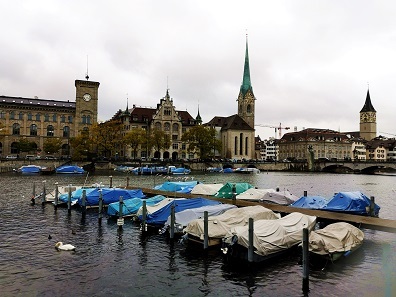 Even on a rainy weekend, Zurich is still extraordinarily beautiful. Photo: LS. 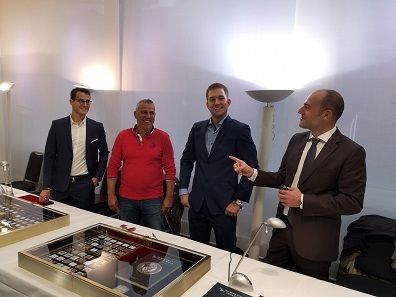 In the context of the International Coin Fair, Sincona AG held their annual auction week. The auction house was founded in 2011, yet it has already reached its 50th auction. This surely is a great success and Jürg Richter wanted to use the opportunity to thank those who had made it all possible. Sincona expressed their gratitude and appreciation by way of their 50th anniversary auction. The auction house had invited national and international partners to present their companies and include their own lots in the catalog. Without a doubt, this is a statement that every numismatist should take note of. And it was applied during the International Coin Fair as well. 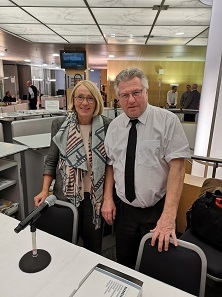 Ruth Niedermann (left) and Ruedi Kunzmann once again applied all their expertise in the organization of the International Coin Fair in Zurich. Photo: LS. 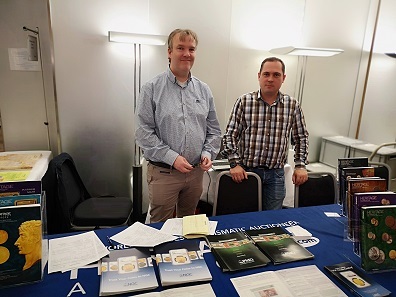 Ruedi Kunzmann, the coin fair’s organizer and president of the Numismatischer Verein Zürich, also emphasized the importance of international cooperation. He pointed out that rivalry would not work in the long term. From an economic point of view, coin dealers and collectors as well as journalists might be competitors. However, in the small world of numismatics, yielding to such reasoning would not help anyone. Good and productive work was only possible by sharing information. After all, when the industry is doing well, everyone is doing well. 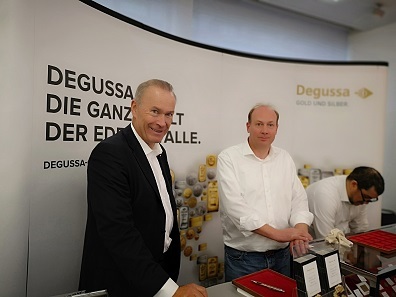 Frank Baldacci and his colleagues at Numismatica Genevensis SA had a great time in Zurich. Photo: LS. Against this backdrop, coin enthusiasts met at the 47th International Coin Fair. Coin dealers and auction house representatives had travelled to Zurich from all points of the compass. Needless to say, Switzerland was especially well represented. With the latest issue of NumisPost in hand, both experienced collectors as well as young numismatic reporters were ready to stroll around the convention hall. Dimitrios Gerothanasis told us about the successful Nomos AG auction which had taken place the day before the fair. Photo: LS. Collectors of any field found countless interesting coins, medals, banknotes as well as stocks and bonds. As per usual, the morning of the first day was quite busy, but the afternoon was considerably calmer. This constituted the perfect atmosphere for expert consulting, prudent purchases, interesting discussions as well as getting to know new people. The Swissmint wheel of fortune was very popular. Photo: LS. At 2:00 pm, the convention hall was deserted all of a sudden. Swissmint had just announced another round of their popular wheel of fortune. That certainly was a highlight for everyone – including the younger generation of numismatists. While fair attendees were lining up in front of the wheel, Andrea Senn had a big smile on her face while she told me about the success of the “Swiss Army Knife” commemorative coin. The Swissmint team is very proud of the success of the “Swiss Army Knife” commemorative coin. Photo: LS. 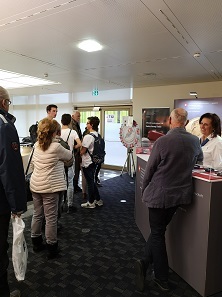 She pointed out that the cooperation with Victorinox had made it possible to attract not just one, but two groups of collectors, as pocket knives are just as popular a field of collection as coins. The combination set had made collectors of pocket knives aware of the medium of coins – and coin collectors, on the other hand, had shown great interest in the special Swiss Army Knife. 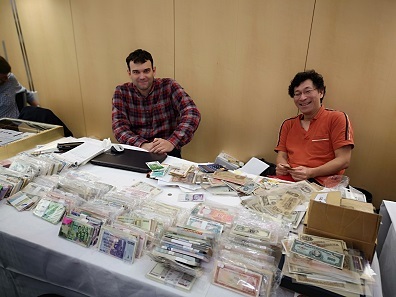 An extensive selection of banknotes was offered at the table of Henri Hirose. Photo: LS. Fritz Ruprecht at the table of Hiwepa. Photo: LS. At the Hiwepa booth, one could not only learn a lot about economic history and purchase beautiful stocks and bonds. Fritz Ruprecht also gave an interesting account of his experiences in and opinion on the developments of auctions in the past 25 years. He said the fact that internet auctions and digital bids were the norm nowadays was a pleasant development seeing as it allowed dealers to easily reach collectors all over the world. Degussa, too, was present at the fair. Photo: LS. And the European representatives of the American auction house Heritage had also travelled to Zurich. Photo: LS. But he was also convinced that public auctions should not be given up. In his opinion, these auctions represent a certain quality and they confirm the trust in an auction house bidders continue to have. He advised his colleagues not to forget about demonstrating physical presence and offering those who still want to use an actual bidding card an opportunity to do just that. Before they rushed off to their own auction, Leu Numismatic AG also offered their expertise at the coin fair. Photo: LS. 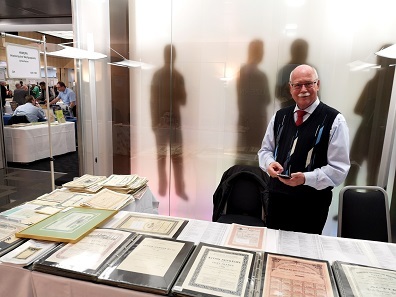 Among others, his colleagues from Winterthur, Leu Numismatik AG, do in fact still hold public auctions even though bids via phone and internet are, of course, more than welcome. 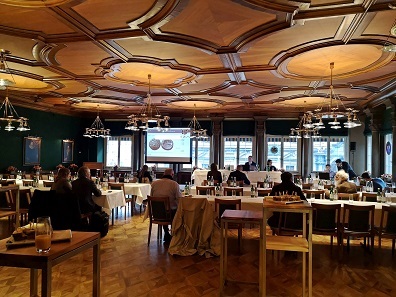 They held their 3rd auction at the stunning Zunfthaus zur Saffran on the evening of the first fair day. The auction hall at Zunfthaus zur Saffran offered a pretty backdrop for a successful auction. Photo: LS. Both for the bidders as well as the auctioneers, the auction was a great success. All of the offered lots were sold and most of them easily exceeded their estimates. The fact that the somewhat economical heating of the room forced most of the attendees to put on their winter coats did not make it any less fascinating to still be physically present at an auction the old-fashioned way. 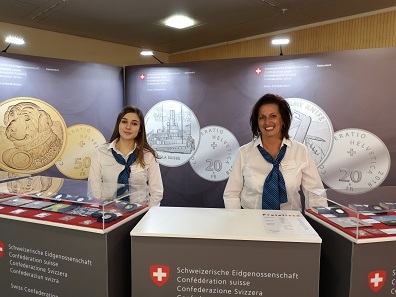 The 48th Basel Coin Fair will take place on February 9, 2019. 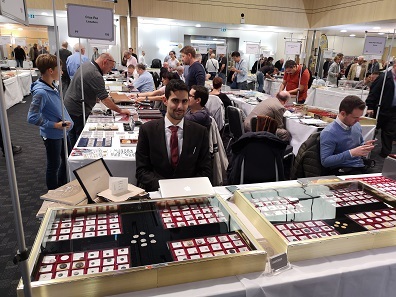 You can attend the next International Coin Fair in Zurich on the last weekend in October of 2019. More information on the organizers of these fairs is available on the website of the Numismatischer Verein Zürich.